THERE is more than meets the eye in Tanjung Sepat, south-west of Selangor. And when it comes to good food, you will be spoilt for choice because there are many reputable food outlets in this small coastal village. Small town delight: The char koay teow that is full of flavour. Now, things can take a different twist, especially after dark and if you are not familiar with this village. My wife Michelle and I went on a cycling tour starting from our home in USJ26, Subang Jaya to Tanjung Sepat. We rode for 75km one-way to reach our destination and put up for the night at a homestay facility there. An air-conditioned room costs RM90, which is pretty decent and considering the fact that the operator allowed folding bicycles to be brought into the room. After six hours of cycling, we had a good rest and decided to cycle around the village. Although most of the residents in Tanjung Sepat cycle, we stuck out like a sore thumb. Why? Well, the villagers are not used to seeing people cycling using a bicycle helmet, gloves and safety lights. Anyway, after a simple dinner, we decided to explore Tanjung Sepat on foot. There were plenty of surprises in store. The first thing I noticed were the two stalls selling char koay teow. I could not resist and decided to give this a try. The stall at Lot 427 (N 02 39 629, E 101 33 653) is located along the town’s main street and we noticed a long line of customers waiting for their take-aways, for supper. 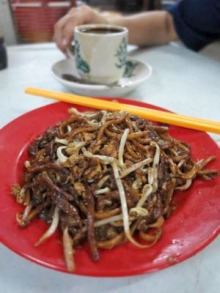 A plate of char koay teow costs RM3.50 and a cup of Kopi-O kosong is RM1. When it comes to taste, this stall scores a six out of 10 on the Samo-scale. The noodles are also full of flavour and worth every ringgit and sen we spent. 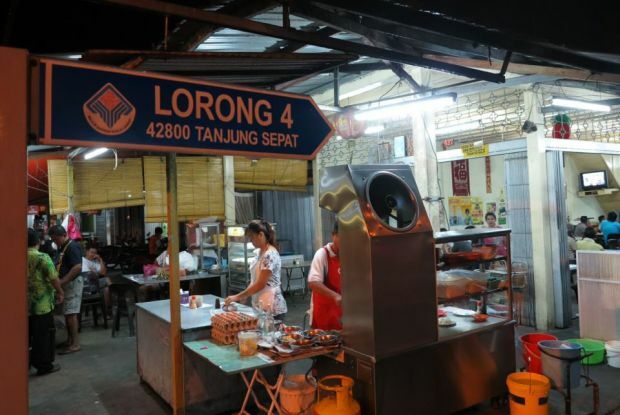 Now, before you go on a trip to Tanjung Sepat to savour the black char koay teow, take note that the stall at the coffee shop in lot 427 opens only at night, from 7pm until midnight.